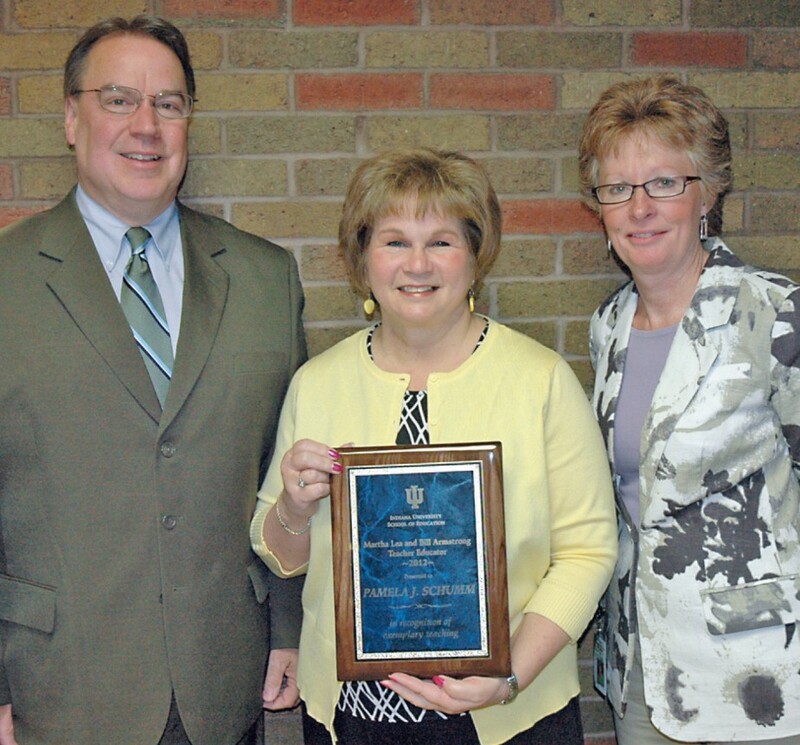 Pam Schumm was honored by Indiana University in 2012 with the Armstrong Teacher Educator Award. This honor is just one of many she received during her 41 years at Wawasee High School. Presenting the award to Schumm, center, were Superintendent Dr. Thomas Edington, left, and educator Kristi Harris, right. Retirement won’t come easy for Pam Schumm, educator with Wawasee High School since 1974. When Schumm arrived in the Wawasee area for her interview, all she knew was a cute little restaurant called Foo and Faye’s served great Chinese food and the one stoplight in town wouldn’t keep her here more than two years. Forty-one years later, she has found a home for herself and her husband, Kip, along with their two daughters, Katrina and Kristin. “There was no defining moment when I knew it was time,” said Schumm of her retirement decision. Schumm graduated from Michigan State University in 1974 with a bachelors of science. She earned her masters of education in 1978 from Saint Francis University in Fort Wayne. Her education position presented her with the opportunity to teach all grade levels, but her passion in the biology field was obvious to any student who passed through her door. Schumm taught honors biology, biology I and II, life science, intro to chemistry and physics and human genetics and bioethical decision-making. Her participation in many extracurricular events through Wawasee High School has also given her strong community bonds, providing her with life-long friends. Schumm has coached boys swimmming, volleyball and cheerleading, and been the easily-recognizable voice announcing various sporting events She also acted as the freshman class sponsor, Scrabble Club advisor and summer swim instructor. Although Pam’s teaching career looks great on paper, it is the heart and soul that has truly impacted the Wawasee community. In 2014, Schumm was presented the Syracuse-Wawasee Chamber of Commerce Outstanding Educator Professional award. Sixteen times, Schumm has been selected by students to receive either the Outstanding Teachers Award or the Academic Impact Award, an amazing number by any standard. In 2012, Schumm was selected by Indiana University for the Armstrong Teacher Educator Award. She was honored to be selected also by McGraw Hill publishing company as an advisor and contributor for biology textbooks. Her love of traveling, visiting Florida, New York City, Chicago, and the Virgin Islands, will be less of a time constraint. Her pure fascination with polar bears will be something she can share with her grandson, Chase Berg, and her other family members instead of students. Currently, Schumm has been enjoying gardening and summer activities. She also has a beautiful koi fish pond she enjoys tending to. To celebrate her retirement and her many years of teaching within the community, Schumm will be honored at a community party held at Wawasee High School. From 2 p.m. to 4 p.m. Saturday, June 27, students, fellow educators, parents and the public may join in wishing Schumm many wonderful years of retirement, and thank her for all her work within the Wawasee community.